Tastes of the Island of Gods | What an Amazing World! Bali lures people from all over the world to come and see its prolific rice terraces, turquoise beaches, rich marine life, and active volcanoes. Also for its unique cultural scenes mostly exclusive to this island – with a land area a little larger than Connecticut or about twice the size of Luxembourg – among Indonesia’s 17,000 chain of big and small islands. But only a handful of people leave their houses and go all the way to this tropical paradise with Balinese food on their minds. Nasi goreng – literally fried rice – often becomes the dish of choice for those who have the curiosity towards Bali’s local dish, but not enough time or courage to sample a wider array of local cuisines. although one can actually find it throughout the vast archipelago with variations from each region. However nasi goreng is not an exclusively Balinese dish as it can be found easily throughout Indonesia – with variations from one house to another. Only trying nasi goreng while traveling to Bali or Indonesia in general is comparable to having fish and chips while one is traveling in the UK; sure it is a dish the locals eat, but the country has a lot more to offer than just that. Sometimes we are tempted to eat something we are rather familiar with, than to expose our taste buds to completely new flavors. But in Bali it is also a matter of availability – Italian, French, Japanese and American restaurants can be easier to find than those who serve local dishes, particularly in the most touristy places. Now that the government is attracting more Chinese tourists to come we can expect new Chinese restaurants opening up in the crowded southern Bali. Finding local joints serving authentic Balinese dishes is more about understanding how the different peoples who came to the island centuries ago have shaped the island’s cultural and culinary landscape than just ticking off the list of “been there, tried that”. Chili and peanut are native to the New World, but the European traders introduced them to other parts of the globe during the height of the Age of Exploration. Today they have become staple ingredients in kitchens all across Indonesia alongside with spices native to the archipelago. Chili, in particular, is one thing Indonesians incorporate so profoundly into their dishes. In the form of sambal – ground or chopped chilies mixed with other condiments ranging from garlic, shallot, palm sugar, tomato, shrimp paste, herbs, sweet soy sauce, to basically everything one can find – chili is inseparable from many Indonesian cuisines as well as addictive that some people can’t and won’t leave the country without bringing bottled sambal in their backpacks. Fried, sautéed or raw, dozens of types of sambal make their way to dining tables across the nation everyday. In Bali, sambal matah – literally raw sambal – proves to be a popular accompaniment for fried or grilled fish freshly caught from the island’s bountiful seas. Chopped shallots, garlics, bird’s eye chilies, lemongrass, and kaffir lime leaves provide a fresh kick to the subtle, sweet taste of the fish. 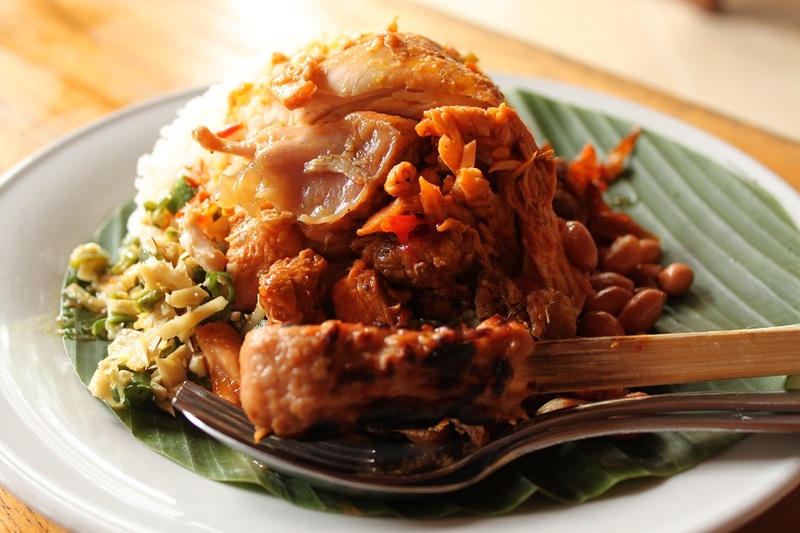 As for land-roaming animals, chicken and duck are widely used in local dishes with betutu as one of the most preferred and distinctively Balinese ways of cooking the birds. Despite the common name, betutu varies from one region to another: roasting and steaming are the most popular methods of cooking a betutu, while stuffing the chicken or duck with herbs and spices is generally practiced in the preparation process. Of all betutus that I have ever tasted, by far Pak Sanur’s ayam betutu in Ubud is still my favorite, although the fact that it comes with very spicy and delicious sambal may have contributed to my biased preference towards it. 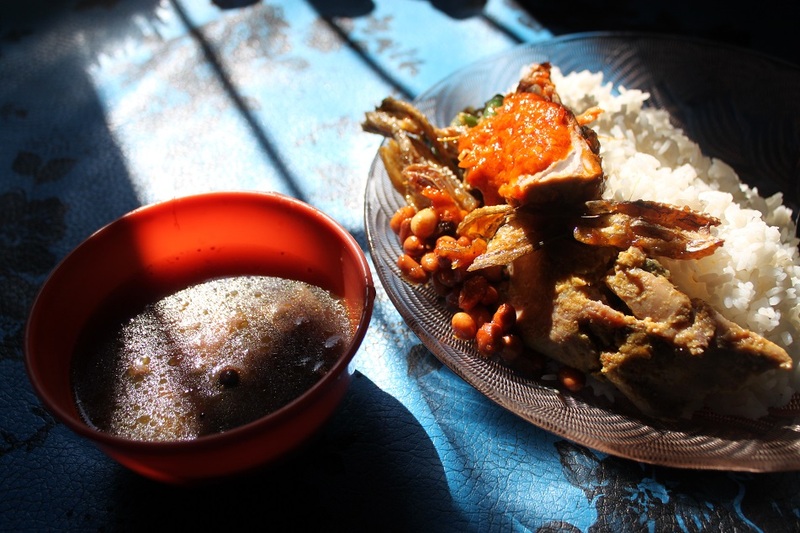 During my last year’s trip to the island when I went to Singaraja on the island’s northern coast I discovered a humble dish which, as my driver put it, is very typical to that region. A small bowl of soup primarily made from lentil-like local ingredient known as undis is a kind of dish I always look forward to savoring in each and every visit to the island. Jukut undis was cheap, unpretentious, and available at modest local joints, or warung, where ordinary Balinese go for breakfast. But if uniqueness of the ingredient is the what one is looking for, jukut ares is the dish to try. Made from ares (young banana stem), it takes quite a long time and much effort to prepare. First a banana stem must be chopped off for only its core is used. Then using a gunny sack the core’s fibers are extracted by swirling and tossing the sack. The remaining fiberless soft core is what Balinese use to make jukut ares. “It looks and tastes like meat,” Pak Putu, another driver who took us to the far northwestern corner of the island described it. Balinese cuisine reflects the richness of the island itself, both from land and sea, and forms a crucial part of the island’s cultural landscape. To fly those hundreds or even thousands of miles to get to this part of the world and sample what its nature provides not only is a commendable gesture to show the locals how much you appreciate them, but also a way to learn and immerse into the local culture so you will return home even richer… in experience. Bebek betutu versinya banyak, Kak Danan. Waktu itu coba yang versi mana? (gak ada versi Hermes lho ya :)). Kalo ke Bali lagi cobain jukut ares, unik dan khas Bali banget. Ada yang langsung suka, ada yang butuh waktu untuk suka, ada yang yang suka sama sekali. Bumbu Bali memang unik sih. Ah plecing kangkung khas Lombok. Puedess tapi enak! Danke, Dina. In der Tat! Bali ist eine göttliche Insel. One thing that makes Balinese dishes so delicious and fragrant is the generous use of spices and herbs. Have a lovely Sunday to you, Klausbernd, Siri & Selma too! I miss Bali, and I miss its dishes, too. As a native, we usually eat all of foods you’ve mentioned. Spesifically in Singaraja, the land where my very existence began. Jukut undis (used to have that everyday for breakfast) and sudang lepet (have you tried that? It’s a crispy, salty dried fish, very delicious) in the shore of Sangsit where the Tawan Karang Law once took place, then move closer to the downtown at noon where we can meet Balinese and Chinese culture blend in one plate, called Siobak. We don’t usually eat Babi Guling everyday, its purpose originally for special occasions only, just like many kinds of Lawar (lawar getih, nangka, belimbing, and so on), yet one can easily find those dishes in local restaurants nowadays. Oh, don’t forget urutan, pork’s colon filled with pork meat and some spices and herbs. 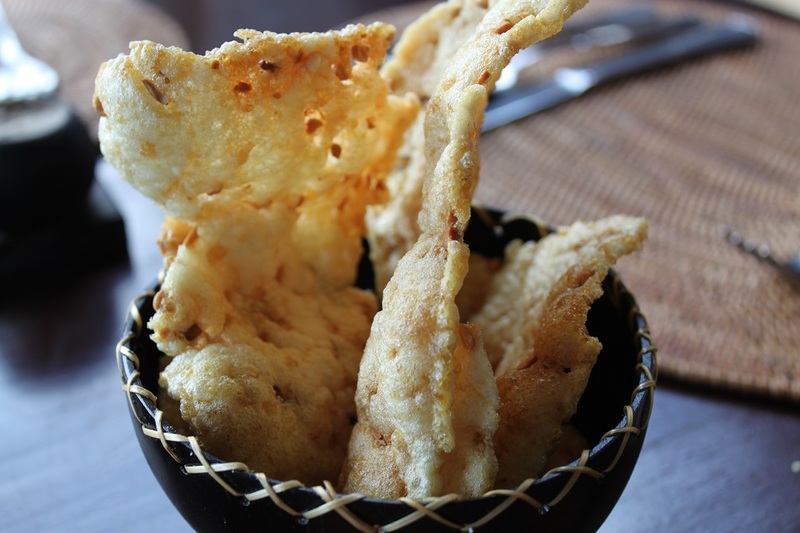 And also krupuk kulit, made from fried babi guling’s skin *alert: cholesterol level*. Ares is really good too, as you have mentioned. We end the day with some grilled tunas (cakalang, to be exact) and the spiciest sambal matah you’ll ever found throughout the island, in an eating style called “megibung”. Don’t forget olah-olah (vegetables) and some fruits from the offering at the temple. Ah, I miss the festive of Bali. A lot. Thanks for writing this. Sorry for this long comment. I didn’t know that you’re from Singaraja. What a nice surprise! From your description sudang lepet sounds like ikan asin jambal, or they are actually very similar? What I really want to see is the process of making ares, as so far I’ve only been explained about how it is made, but I haven’t really seen the making myself. I tried to find olah-olah on the internet but I couldn’t find any info regarding the dish. Is it different from urap? It’s kinda similar, except sudang lepet is thin-sliced so it will be very crispy when fried. Making Ares is exhausting and consumes a lot of time, but the result is unforgettable. I remember when I was little, watching my father make jukut ares for pujawali (temple’s birthday party, literally) with other men and it’s already exhausting for me just to watch them. (maybe it’s because they made another dishes, too, not only jukut ares). Yes, olah-olah is kinda like urap, but with different sauce, made from coconut oil’s residue (ampas kelapa). It’s more famous in Lombok than Bali, actually. 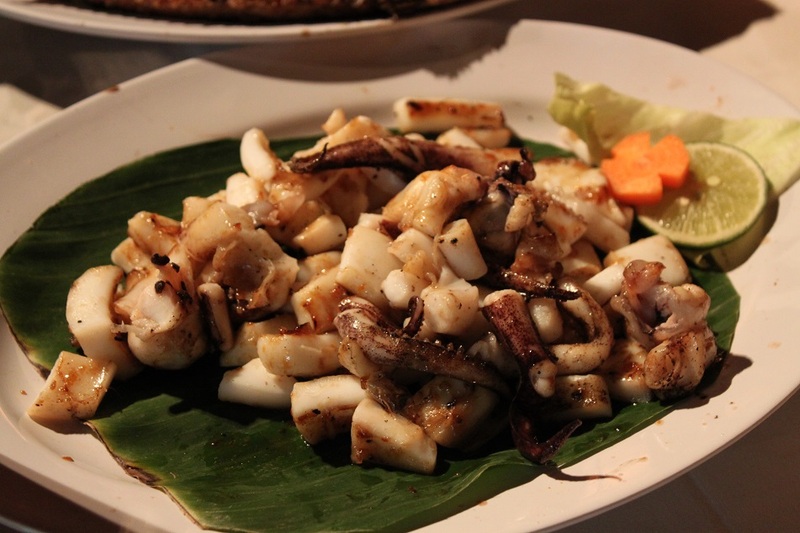 People are more often called it as Lombok’s dish, not Bali’s. But I prefer called it as Balinese dish :hihi. Speaking of your father making jukut ares reminds me of what a person told me that in Bali it’s the men who do the cooking while women prepare the temples every time a big ceremony is being held. That is so unique not only in Indonesia but anywhere in the world, I believe! 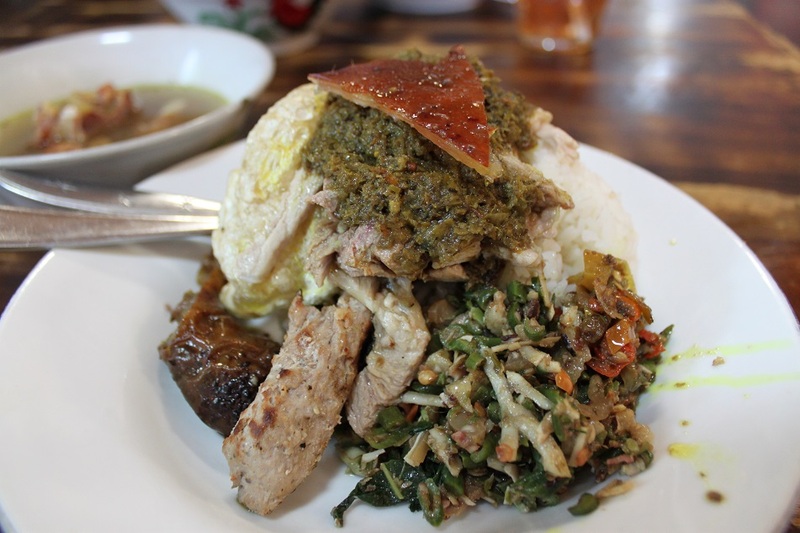 Great examples of the Balinese food. 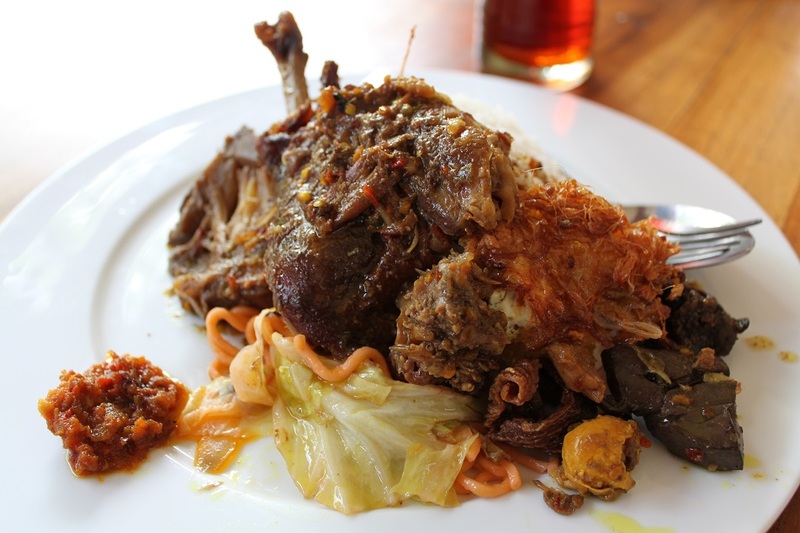 Bebek Betutu is my favourite – no trip to Bali is complete with a taste of it. I’m not a big fan of fish dishes, apart from squid and the occasional stingray, but they do still look delicious in your photos! 🙂 Have you ever tried Telur Bumbu? I love both bebek and ayam betutu, especially if it comes with very spicy sambal! 🙂 Actually I haven’t tried telur bumbu because to my eyes it looks exactly the same with telur balado — a dish from West Sumatra widely available throughout the country. Have you tried both? Are they different? Oh! your post is God sent! 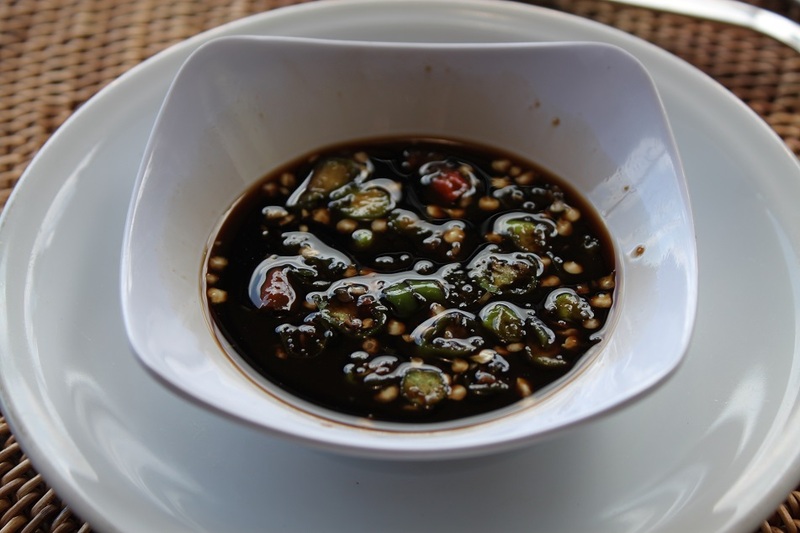 I was thinking of having some yum peanut sauce that left a taste in my mouth when I was in Ubud a couple of months ago! Hi Sonam. I like how this post brings that memory of the delicious peanut sauce you had in Ubud — it’s one of the most common condiments for satay/sate. Its sweet and savory flavors are absolutely perfect for those tender skewered meat. As for fried banana, it happens to be my father’s favorite snack. Did you have it with chocolate sauce, cheese and ice cream? Bama, I’m so glad I had dinner before reading this post! Your photos are mouthwatering to say the least, and I can almost taste the freshness of the grilled seafood on Jimbaran and the complex flavours of the bebek/ayam betutu. 🙂 The jukut undis and nasi campur ikan we enjoyed in Singaraja was quite possibly the best breakfast I’ve ever had on all my travels! Sambal Matah includes some of my favourite ingredients and sounds delicious. You’ve made my mouth water and I also now have an urge to visit Bali! Thank you. Itu dibantu sama temen untuk editing logonya. Nicole! I remember you told me how interested you were (and still are) in Asian food. Hopefully sooner than later there will be some decent Indonesian restaurants opening near where you live. Sama jukut ares..udah nyobain belum? Soalnya so far belum pernah nemu makanan lain yang terbuat dari ‘batang’ pisang selain jukut ares itu. Lho Debby itu orang Malang atau Bali sih? Beberapa aku tau alamatnya, beberapa aku pasrah mau dibawa kemana sama drivernya. 🙂 Ooo, I see. Ah sayang tripku ke Malang cancel, kalo gak aku bisa ketemuan sama dia. 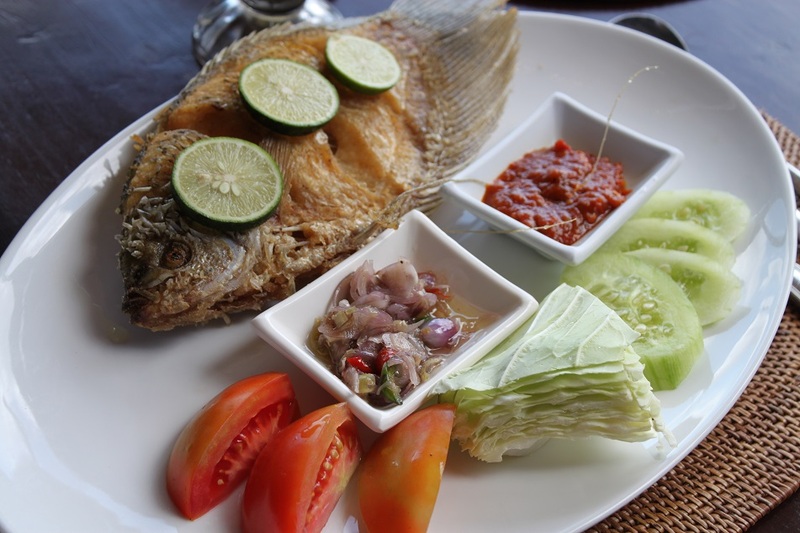 Great examples of Balinese cuisine the fish and chips of Bali. All those foods are tempted. I couldn’t wait to travel back home tomorrow. In my humble opinion, Indonesian foods are the best. Or maybe I can say, Indonesian food is the best for my taste. No matter where I go, as long as I can find Indonesian food, it will always be my first choice. Tanya Om Google aja Cen. 🙂 Lempar sepeda? Kebagusan Cen, lempar buaya aja. Oh my, what delightful food! You succeeded in making me hungry. 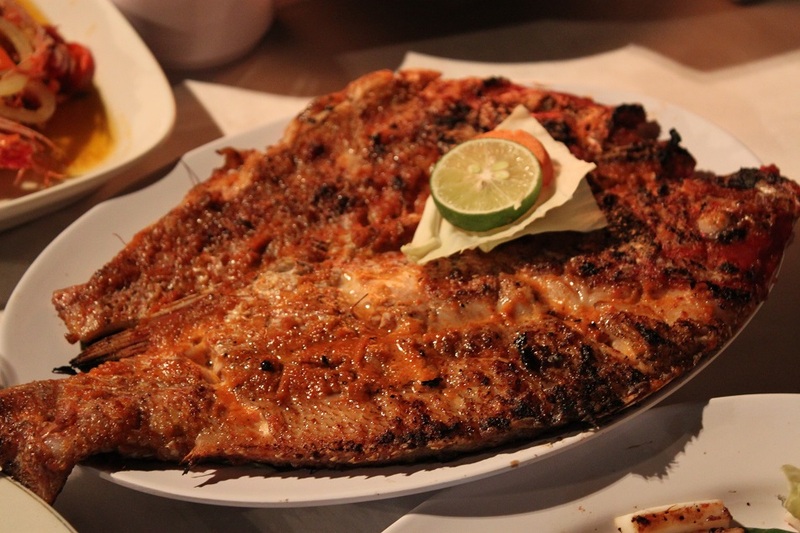 The fish dishes with sambal were some of my favorite things we ate on the archipelago. Sadly, I don’t think we were as daring in Bali as normal. I remember eating sushi in Ubud and lots of nasi goreng in the north. Oh well, I guess I have to go back and try these dishes you show here. I’m glad I did, Jeff. 🙂 Eating sushi in Ubud is a funny irony since it is inland and you have a wide selection of dishes to choose from. But I love sushi so much, so having sushi in Ubud doesn’t sound that bad after all. 🙂 Jeff, the next time you come to Bali (or find any Balinese/Indonesian restaurant in the US) you should try bebek betutu if they have it. James didn’t like his first bebek betutu, but when we tried it in another restaurant (pictured in this post) he absolutely loved it. To travel to a place and not try the local dishes is a sin. You’ve just shown us that! The food all looks delicious. Hi Angeline. Sometimes local dishes can taste too weird for our palate, but most of the times sampling local delicacies everywhere we go is a satisfying experience that shouldn’t be missed. We planned to go to Bali last year for our honeymoon but then couldn’t make it happen:( We want to go there some day still. And when in Bali, I will just pull out this article to try all these yummy goodness! I’m really sorry to hear that. But take that as a postponed trip, one that will eventually happen sooner or later! 🙂 When you do go, I’d love to hear your culinary exploration on the island — hopefully this post will help! Yum, this makes me want to go to Bali! I’ve never been before, but do you reckon the food is similar to Malaysian food? Bali is that close to Melbourne — pack your bags and go! 🙂 It’s not surprising if you see similarities among Southeast Asian dishes as they are all influenced by Indian, Arab, and European cuisines introduced by spice traders. GREAT post, making me ever so hungry now! You’re too kind, Randall, but thank you. 🙂 Not only an open mind, we also need adventurous taste buds when we travel to truly understand local cultures. That means you went to Bali before I did, even though it’s right at my backyard. 🙂 Did you have your nasi goreng spicy? I just stumbled upon your blog, and I think what you’re doing is so cool and amazing. I’m definitely going to keep following to see how your resolution turns out. Thank you so much for clicking that ‘follow’ button. 🙂 I really appreciate your support. HI Bama, your food shots made me drool again. They all look and sound delicious. My cousins, aunt and uncle, were in Bali last week. I’m still so jealous. I knew they ate a lot of traditional food and extra jealous now knowing they probably ate a lot of these food that you featured. One day it will be may turn. Hi Marisol. The next time you go home and see your relatives, you know Bali is just a short hop away! 🙂 Your cousins, aunt and uncle went to Bali just at the right time — it can get really overwhelming during peak seasons. Gorgeous food photos! Food and travel are so connected. One can learn a lot about a culture only by its food. Some of the best travel moments I have had in my life have included a fork and knife! Thank you for sharing. And now I am hungry for lunch! Please check out my blog if you are interested at https://bulldogtravels.wordpress.com/ . Great point. Eating local food is sooo much easier! Thank you, Jia. Traveling to Bali does that to us — we leave the island with lots of stories to be written and shared. Hey Kak Cumi. Nah saya sebenernya agak-agak bias kalo disuruh menilai enak enggaknya bebek, soalnya buat saya bebek itu cuma ada dua: enak dan enak banget! 🙂 Tapi kalo gak salah inget memang dibandingkan Bebek Tepi Sawah atau Bebek Bengil, rasa Bebek Joni lebih spesial. Love your pics and info. Makes me glad I went before the European/Chinese restaurants arrived as number one on my list is food when I travel. I was recently told Cuba is mostly fried plain food (unless you stay in a resort) and crossed it off my list. Thank you, Mallee. 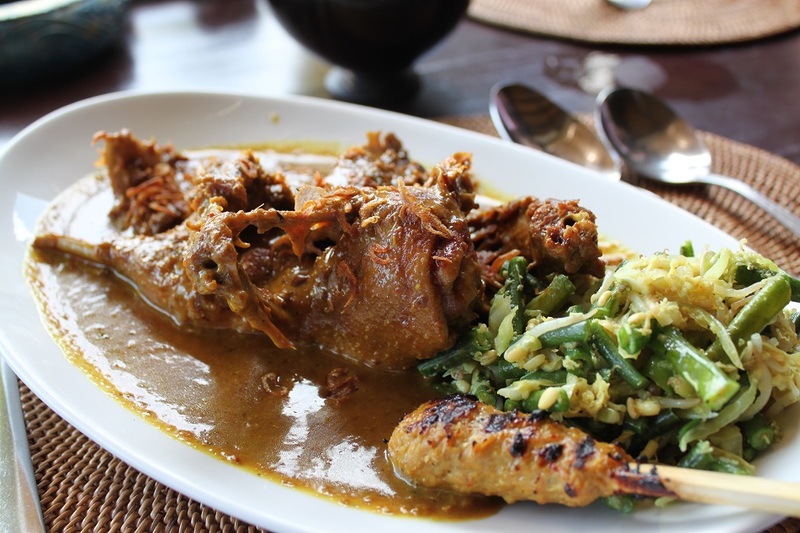 What was your favorite Balinese dish? I didn’t know about Cuban fried food, but maybe they got it from the southern Spain — I was told that in that particular part of the country people love to fry their food. Just maybe. Gado gado. Liked it so much I learned how to make it! 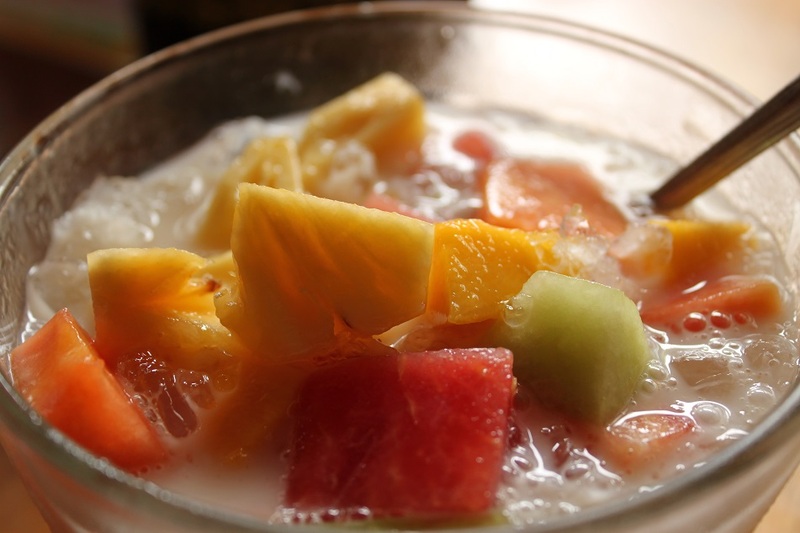 Your photos and descriptions have made my taste buds salivate for flavors I first encountered in Bali just a year ago! I really miss the food, the people, the culture and cant wait to go back. Thanks for bringing it all back to me! Hi Peta. I’m glad this post brings back those good memories of Bali to you. I have been to the island for so many times now, but I don’t think I will ever get bored of it. Each corner has its own charm and things to discover. Duh salah bener ini, di jam 11 siang begini, pertama kali cek langsung artikel yang ini. Artikel yang sukses meningkatkan rasa lapar menjadi sepuluh kali lipat. Wuah, kok ya pas banget mendaratnya di post yang ini. Kalo ke Bali lagi, dan kebetulan lagi di sekitaran Singaraja cobain Jukut Undis deh, Bart. Unik rasanya, dan menurutku undis itu mengingatkanku sama kacang ijo somehow. Mungkin karena ukurannya. Ahhh, makasih makasih. 🙂 Seneng post ini bisa menggungah selera. Jukut Undis itu banyaknya di warung-warung pinggir jalan. what a wonderful post, everything looks truly delicious..my mouth is watering! Thank you! I really miss the richness of Balinese flavors. Shame on you, it’s a little after 4.45pm and my imagination has run riot over the dishes you have described so well that I can almost smell their swirling aromas. I was going to grill a chicken breast and serve it on a base of mashed potato but now I have to go to the local Thai joint for take away. Boo Hoo. Only joking, got to keep the digestive juices flowing. I’m finding myself very fortunate for having stumbled across this post while I’m actually visiting Bali. I must now venture forth to as many places as possible on your list of recommendations and eat (for days! )… Starting with that delicious Babi Guling 😉 Fantastic post! Thanks for (successfully) spreading the wonder that is Balinese cuisine to people across the globe! for me, bali is all about pork and spices…..
Haha.. that is kind of true actually, because you can easily find restaurants and stalls serving babi guling on the island. Hi Terri. Jukut ares is unique to Bali as I don’t recall ever trying any dishes made from banana stalk. So the next time you go to Bali you have that on the list of dishes you have to try. 🙂 Oh I was surprised as well when I found out that we could actually eat ferns. We took a cooking class in this remote eco-lodge in western Bali, and a day before we took a garden tour and learned about all those different vegetables we didn’t know we could eat. By the way, how’s the recovery going? I hope you can explore the world again soon! Thank you for featuring this post on your blog, Terri. I hope it helps people understand the diversity of food in this part of the world. All the best and stay healthy!